For my parents, home is where they park it. The author’s parents outside their motor home. For my parents, home is where they park it. Last summer, they sold the 3,500 square-foot house that both my mother and I grew up in. 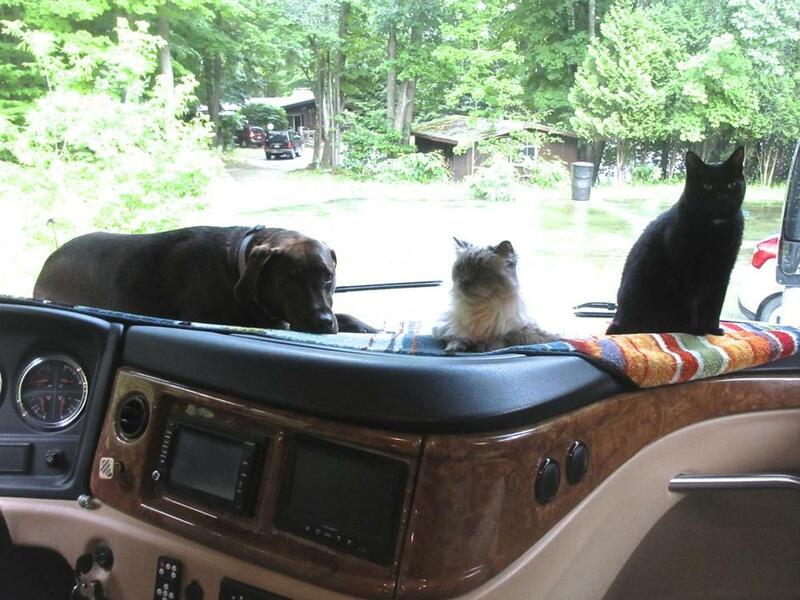 With downsizing and exploration in mind, they cruised right past their Baby Boomer peers and moved into a decked out Class A motor home — with two cats and a Lab mutt in tow. What started as an unconventional way to house hunt has morphed into their new way of life. It’s been a bumpy ride at times, but they are adapting to a mobile lifestyle. Now, a year into their adventure, I ask them to explain what happens after you make the decision to pare down, pack up, and hit the road. Mom, Dad – Sue, Dave – Hi. 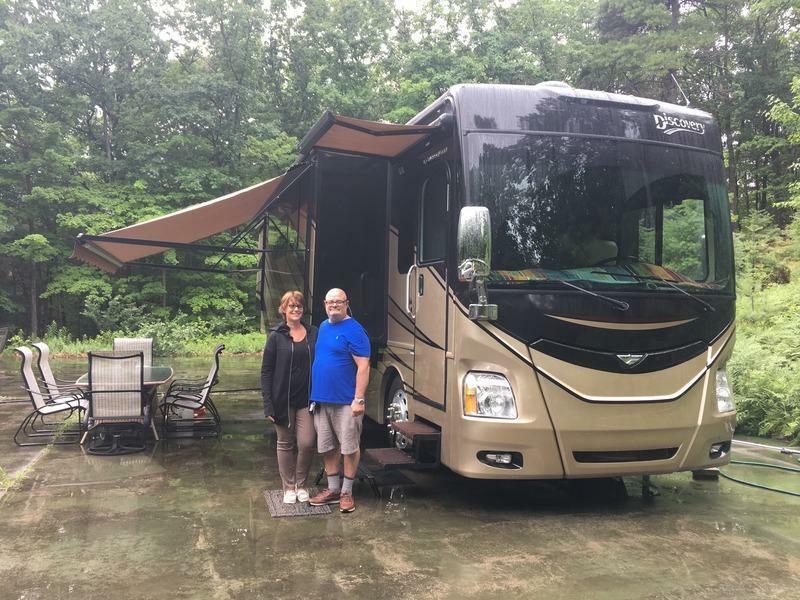 What spurred you to move into an RV instead of another house? S In the very beginning, we wanted to use the RV as a means to look around the country and find a place to settle down. But we quickly realized we wanted this to be more than just a temporary way of life. OK, let’s talk logistics. You don’t own land right now. Where do you stay every night? D If our tanks are almost full, we’ll find a campground or park and stay overnight. We use their electric, sewer, and water so that we can run the laundry and dishwasher. Then we’re good to empty our holding tanks, refill with fresh water, and boondock [live completely self-contained] for the next four to six days before we have to do it all again. And when you’re boondocking, is it easy to find a place to set up camp? S It truthfully takes a lot of planning and forethought to boondock. I use an app that shows the businesses that not just allow, but encourage overnight RV parking — places like Cracker Barrel, Walmart, and Cabela’s. We make sure that it’s a well-lit lot in a safe area. We always feel safe, since we’re lucky enough to have an extremely protective dog. D It goes to a company that specializes in forwarding mail to fulltime RVers. I check my deliveries online and have the option to have them scanned, mailed to me, or shredded. It’s about $250 a year. How do you pick an RV? S It depends who you ask. There are people who wouldn’t want our type of setup because it’s too much bling. It’s too far away from “camping.” Some people want that rustic, outdoorsy, pioneer experience. We don’t. I hope to try hiking and the activities that are more synonymous with camping, but I doubt I will – and that’s OK! There’s a place for people like me, too, in this culture. It’s so diversified; there are pop-up tents, 45-foot tag axles with two bathrooms, and everything in between. Is it more cost-efficient than running a brick-and-mortar household? D No. Upkeep of a diesel coach is expensive. On top of the scheduled maintenance for the motor home, there’s fuel, service contracts, insurance, maintenance, campground fees . . . There’s a lot more than just the mortgage. S We thought we would get a used RV at a low rate, which would be cheaper than maintaining the house, but the confines of that original idea expanded. Instead, we invested in a unit that we are very comfortable living in. What we don’t pay for, of course, is the pool maintenance, landscaping, snow removal, and property taxes. So is this a feasible move for anyone? Can anyone pack up and move into an RV? D Yes, but you have to research it very carefully. It’s not just purchasing your type of vehicle; it’s everything that goes along with it. The industry as a whole has a lack of quality control, and salesmen can be exceptionally tricky. We went through a lot of strife to get to where we are now. S And it’s not work-free living once you’re in. A lot of effort goes into keeping things clean and running smoothly on a daily basis. It’s all relative as far as cost, though. I mean, we went from a 3,500 square-foot house on an acre of land with an in-ground pool, to a 38-foot motor home on a freightliner. What did you do with 3,500-square-feet worth of belongings? D We gave most of it away to family, friends, our buyers, the local food kitchen, and a homeless shelter. Everything else of meaning is in a jam-packed 10-by-15-foot storage unit. What is your favorite thing about being full-time RVers? S I’m truly leaving less of a footprint behind me in an RV. There’s only finite amount of space on this earth and I’m surely not taking up more than my share. I’m much more cognizant of water and energy usage. This lifestyle also forces you to take a hard look at what you can tangibly do without. It’s the ultimate tiny house living. Oh, plus, I don’t ever have to pack for a vacation again — I just bring my house. D Whenever or wherever I stop, I push a button and I’m home. What about your least favorite part? D It’s basically living in a home that’s in constant earthquake mode, which means constant repairs. In the last year, hundreds of items have broken just from normal wear and tear. S I don’t feel as compelled to cook as I did, despite having a full kitchen. I miss my big kitchen and making huge holiday dinners. But we’ve created new traditions and found ways to entertain better than ever before. Do you have advice for prospective buyers? D Don’t buy a brand new unit, or you’ll suffer the anguish of insane repairs since there is virtually no quality control in RV production. The standard for manufacturers is to make sure the unit looks visually great, not caring about what’s underneath. 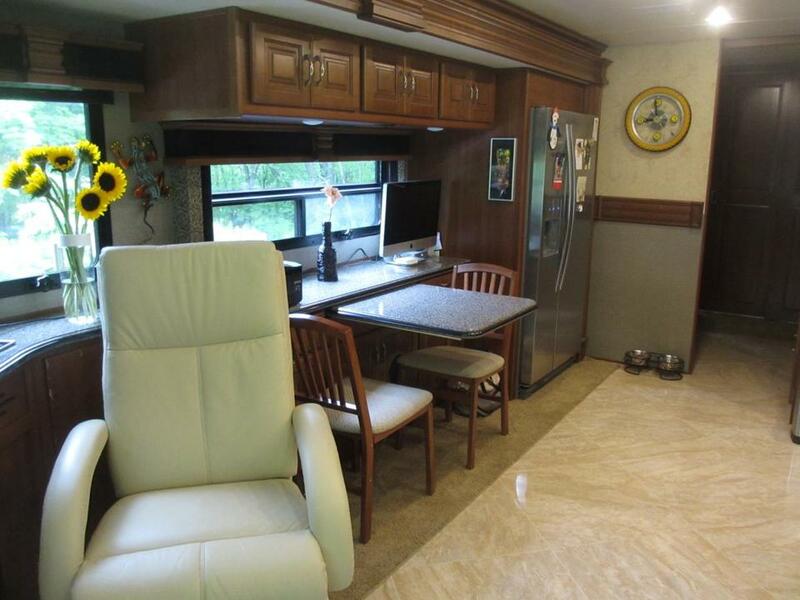 Buy an RV that’s a year or two old with low mileage that’s been stored properly. It’ll save you a lot of time, stress, and money. S Well then, don’t you need to be able to detect things like water damage, leaks, and rust? You kind of need to know what you’re doing. I don’t — that’s why I have you. She has a point, Dad: You’re incredibly business savvy with a background in buying and selling used cars. 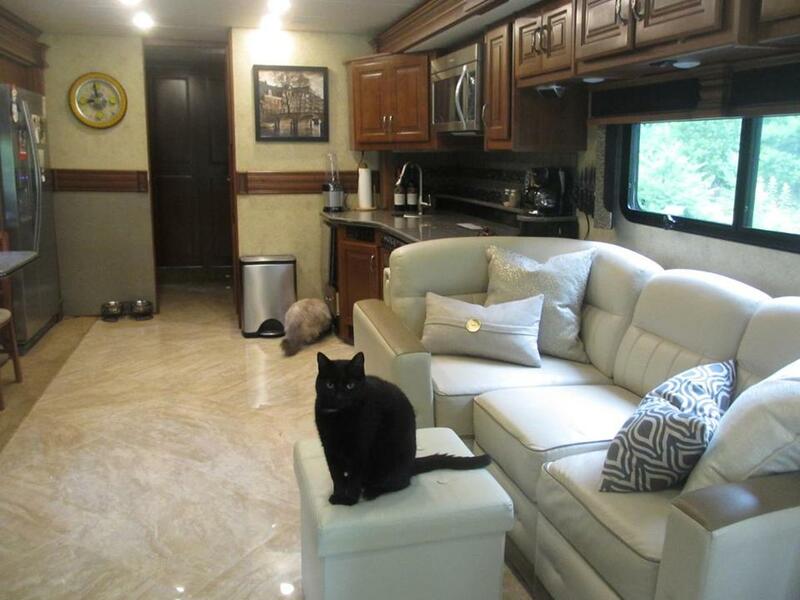 How much know-how do you really need to successfully run an RV? D Knowing just the basics is fine. You don’t need to know a ton going in, because [RVing] is a constant learning experience. I learn something new every day. This is such a vocal community, and there are always, always people who are willing to help you. S That’s true. This culture includes the kindest, most supportive and helpful people I have ever met. From every walk of life. People are so eager to share their experiences and knowledge with you. Will you consider moving back into a stationary house? If so, where will home be next? D When I’m finished traveling every inch of this country, yes. Somewhere warmer. S Oh my good God, David. We’ll find home when we get there.